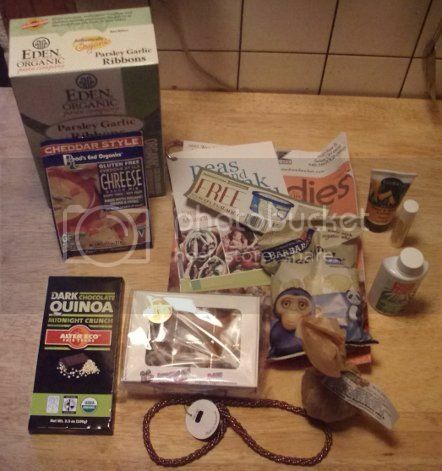 Cook Vegan Lover Package Swap! You know what’s cooler than vegan stuff? New vegan stuff. Whether it’s brand new or just stuff I haven’t had before, I love having a chance to give new vegan things a try. Which is why I signed up to do the Cook. Vegan. Lover. care package swap again this year! Last year was a ton of fun. 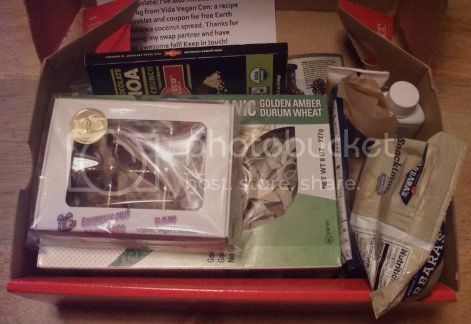 Who can argue with a chance to share great vegan stuff with someone else and get a box of equally great stuff in return? Plus you get to make a new friend. It’s a pretty sweet deal! My swap partner this year was Katie of Vegan Noms. Her blog immediately made me jealous, as she got to go to Vida Vegan Con and wrote all about it, including tons of food pictures! My package from her arrived this past Saturday, and I wasn’t disappointed. Another thing that got me going was the bar of chocolate from Alter Eco…dark chocolate with quinoa crisps! Since I love, love, love crispy chocolate, I can’t see that lasting terribly long. Or at least, not as long as chocolate usually lasts me. The little tube of hand cream and the vegan lip balm are going to be very useful as winter sets in, and I’ve already worn the lovely necklace. The cheese sauce packet is earmarked for this rather interesting recipe, and I can never say no to another recipe booklet! Nor can I say no to more chocolate. And not just any chocolate…raw chocolate! Made by a company local to Katie’s area! 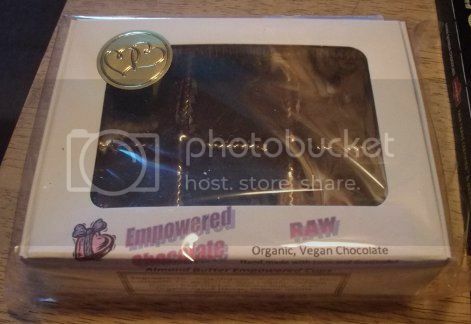 Empowered Chocolate makes 100% raw chocolate treats, and let me tell you, you should go eat some now. This little box has six (now four) almond butter cups in it, and wow. Just…wow. The flavor and texture is so different than the chocolate I’m used to. The chocolate is on the hard side, but smooth, and the almond butter is just a little chunky, making for contrasting textures and a truffle-like treat that’s satisfying in and of itself. Yes, I’m saying that even though I might want to eat the whole box, I don’t feel like I have to. Until the next time I open the fridge and see it sitting there. 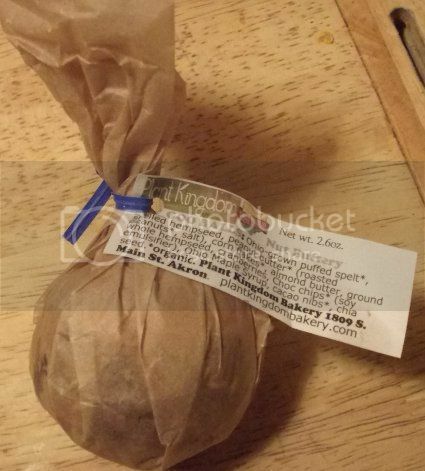 This little bugger goes by the intriguing name of “Goo Ball” and is another local treat from the Plant Kingdom Bakery. Judging by the list of ingredients, it’s going to taste awesome. I couldn’t believe how dense it was when I picked it up. Definitely full of nutrients–tasty, tasty nutrients. I’ll have to report back once I’ve tried a bit of it later this week. I love having things like this around to give variety to my afternoon snacks! So that was this year’s swap package. If you’ve never participated in the swap, keep an eye on the Cook. Vegan. Lover. blog around this time next year and get signed up! It’s so much fun. Thanks to Lindsay for hosting the swap, and Katie for sending such an amazing box! I’m looking forward to eating my way through what’s left. I just bought that Alter Eco bar and it was delicious! Sam, I love this post! So glad you liked the goodies. 😀 I hadn’t tried the Empowered Chocolate, but when I was in the check-out line the lady in front of me looked at me all serious-like and asked “Have you had those before… it is the best chocolate I have ever had in my life” – so I knew it was a go! Hope you like the Goo Ball, lol – they’re one of my favorite snacks. I’ll be doing a giveaway soon with Goo Balls and more of Plant Kingdom’s goodies! There is almost nothing left from your package and I have loved every morsel! So happy to have “met” you. 🙂 Keep up the awesome blogging! Definitely try the Empowered Chocolate! It’s a treat so worth having. 🙂 I’ve been sharing mine with my mom, and she loves it, too. I’ve also been enjoying that Alter Eco bar a lot…crispy chocolate is a weakness of mine.